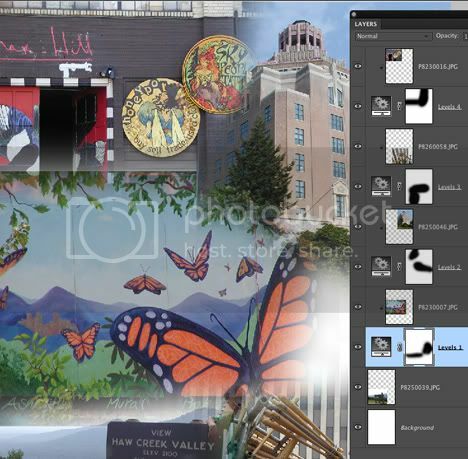 Q: I want to blend several different photos together to create a poster look but in Elements 8 I do not see a blend tool. How is this accomplished? A: Good Question Dale. I am planning on doing a more detailed tutorial on how to do this but I will give you a quick summary now so you can try it on your own. Step 1: Create a new document at the size you want. Go up to to the File menu and choose New>Blank File…. For excellent print quality you should make the new document 250pixels/inch. Step 2: Open the images you want in the poster. Step 3: Drag and Transform the Photos. Arrange your windows so you can see the new blank document you created and the first photo you want to bring into it. Go to the Layers Panel of the photo your going to bring in. Use the Move tool to drag the Background Layer on top of the blank document. When you see a heavy black border appear around the document you'll know it's safe to let go of the mouse. If you want to resize or rotate the photo, press Control-T (Mac:Cmd-T) which will put a bounding box with eight handles around it. If you can't see all the handles press Control-Zero (Mac:Cmd-Zero) so all the handles show. the corner handles to resize it proportionately. To rotate it, place your cursor outside the Bounding box but close to one of the corner handles until your cursor turns into a curved line with arrowheads on both ends. Then you can move your mouse to rotate it how you want. When you are done transforming press Enter to apply the change. Step 4: Group all the Layers with an Adjustment Layer. To Blend the photos together all the Layers need to have a Layer Mask. Here's a link that shows how to steal a Layer Mask from an Adjustment Layer. Step 5: Paint on the Layer Masks to Blend. Choose the Brush tool from the Toolbox. Selct a soft-edge Brush from the Options bar. Make sure your Foreground color at the bottom of the Toolbox is set to black and paint on the Layer Masks in the Layers panel to blend with the other Layers. Here's what your Layers Panel will look similar to when you are done. My son spent a year at UNC Asheville so some of the photos might look familiar! I hope that's enough info for you to get going Dale. If you have a question about any of the specific steps just add a comment for this page and ask it. Thank you for such a wonderful site. This will allow me to learn PSE9. I am a beginner at all these geek stuff, but anxious to learn. I only have a Rebel Xsi but once a learn more I can hopefully improve my photos thru editing.